Indoor plants spread positivity in the house and help reduce stress and anxiety. When placed in the study room, they help enhance concentration and creativity. 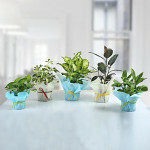 Order this set of 5 refreshing plants online to beautify your home and improve air quality.